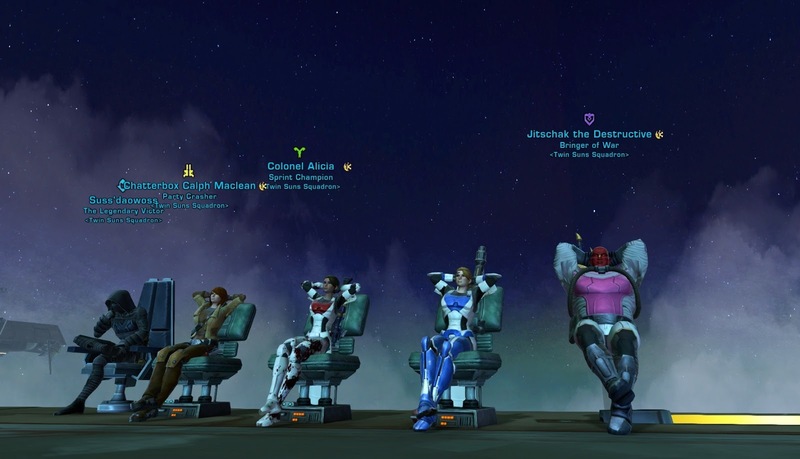 For many of us, the people we interact and play with on a daily basis are a big part of an MMO's lasting appeal. However, I've also noticed that a lot of players seem to pretty much limit these interactions to a single guild - how many times have you heard some variation of the phrase: "Well, everyone in my guild stopped logging in, so I stopped playing as well"? 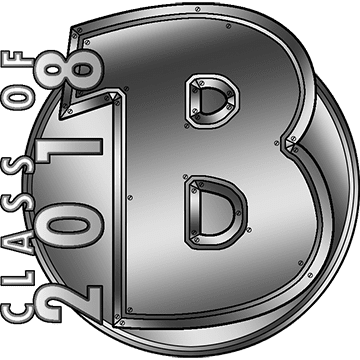 I'm really happy that even though I obviously love my guild, I don't feel nearly as dependent on them, because I have a lot of different ties to the community - not least this whole blogging thing, though that doesn't make for very good screenshots. First off, the obligatory shout-out to my pet tank. 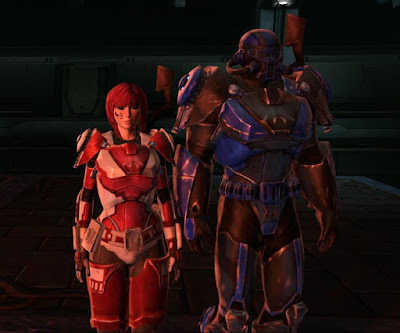 Sadly his interest in SWTOR has been declining for a while and he doesn't play it very much these days, but he's still subscribed, main tanks our operations, and is generally my number one go-to person if I need help with something. 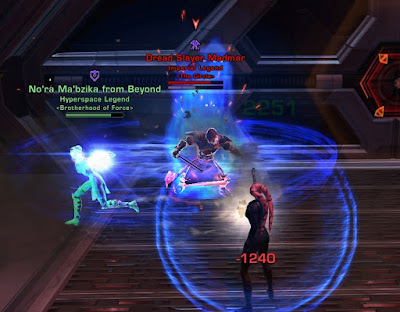 The DvL event rekindled his interest at least briefly and we tackled most of the hardmode flashpoints together while falling into our usual roles of him tanking and me healing. 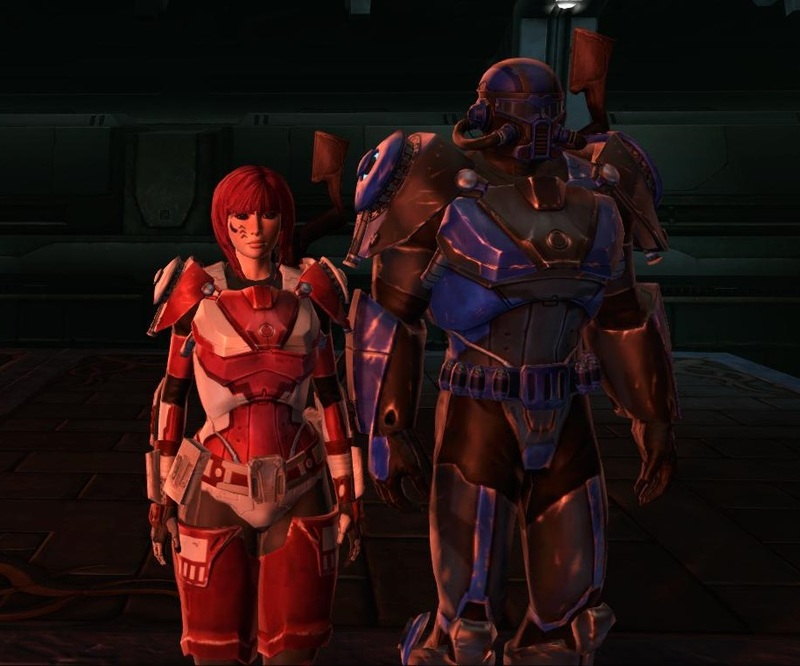 This screenshot actually shows me on my Vanguard alt next to his main, and I found it very amusing how - completely unintentionally - I had ended up giving her a matching outfit to his, creating a sort of "his and hers" look when we stood next to each other. Apparently times have been dire for many guilds due to the lack of new operations, but I'm happy to say that Twin Suns Squadron has been doing just fine. Sure, we too had people quit the game, but we were fortunate in that we also maintained a healthy influx of new blood. Some of our newer members are positively awesome. Here a few of us are chilling between Master and Blaster HM attempts. 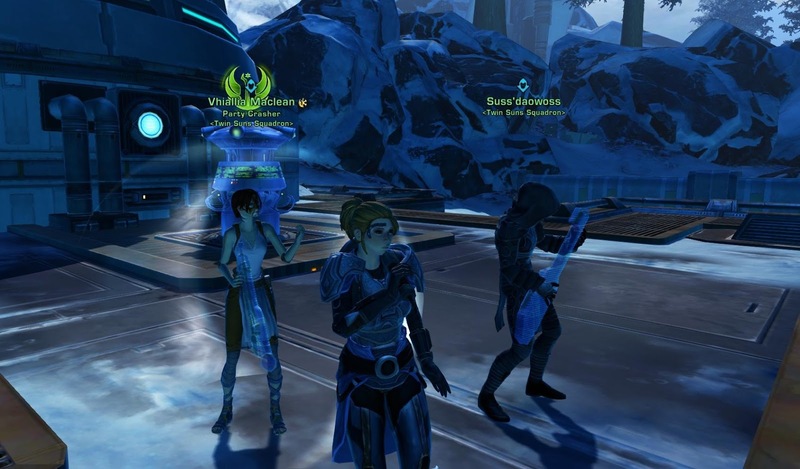 When you're winning Alderaan Civil War so comfortably that you can start a band at one of the side turrets... I've said many times that my relationship with SWTOR's PvP is an endless on-and-off-again affair, but having company really helps to keep me interested. 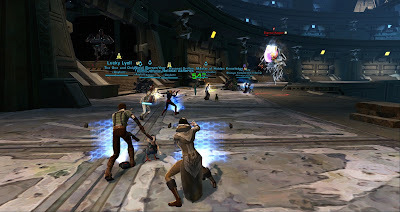 Several of the newer members mentioned above are big fans of doing casual group PvP in the evenings, and I've been all over that. Earlier this year Traitine from Constant Warfare, who's been on my blogroll for quite a while, asked me if I wanted to join him for a stream. I was initially a bit hesitant because I didn't really "get" streaming and I didn't think we were really that close? Why was he asking me? However, I did agree eventually and I'm really glad I did because I had a whale of a good time doing lowbie PvP with him and it's pretty much become a monthly tradition for us at this point. Most of the time I also put some of the highlights up on my Youtube channel later. I don't know if anyone actually watches, but I enjoy doing it for the fun alone. During one of these streams we were joined by Rav from Ravalation and I ended up taking this funny screenshot in a random Makeb arena. 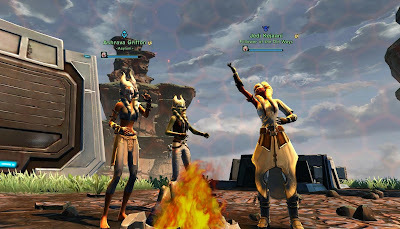 This picture, for me, stands for the fun of interacting with strangers, as there was a third Togruta character in the group and we all ended up doing our racial storytelling emote at the same time while we waited for the match to start, making it look like we were having a grand old time around the fireplace. 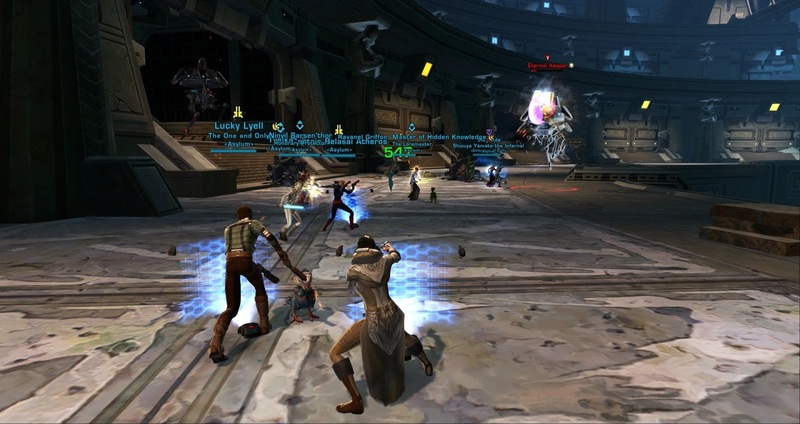 Speaking of Rav, here's a screenshot of me filling in on my gunslinger alt during one of her guild's runs of Eternity Vault. It's a bit of a shame I haven't been able to hang out with them more often but play time is sparse and unfortunately their raid times don't mesh very well with my own availability. I still appreciate the opportunity to hang out with a different crowd for a change. 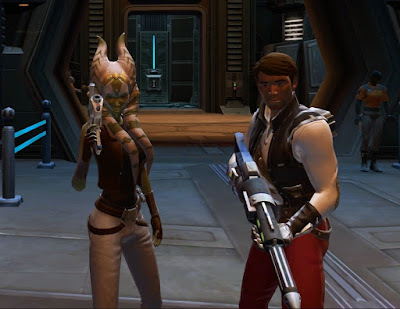 This is me running into Madmar of #SWTORFamily fame in a Voidstar. I felt as if I had spotted a celebrity! For the record, he defended that door like a pro and we never got through (though I don't remember who won in the end). 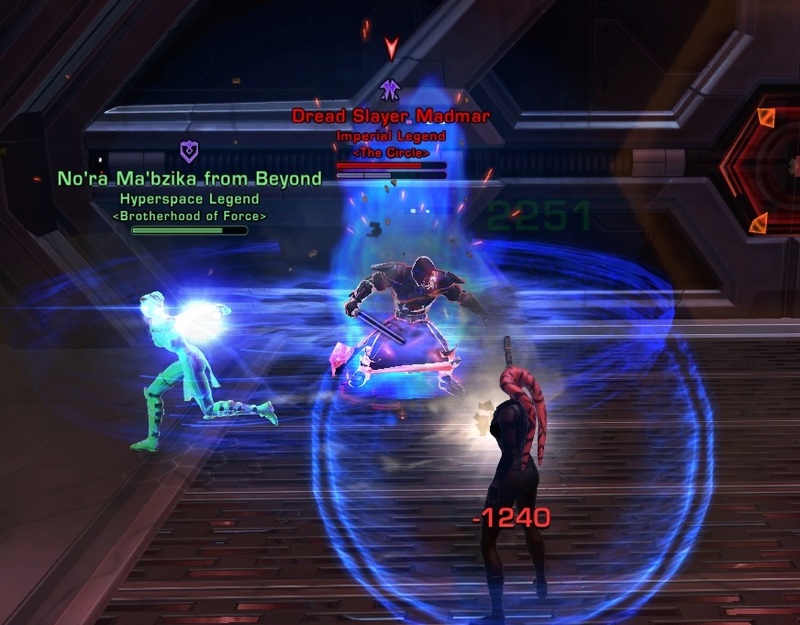 This is just a shot of my Mercenary in a Blood Hunt pug, but I included it in here because in a way I consider pugs "my team" as well, as I do really enjoy pugging in this game. 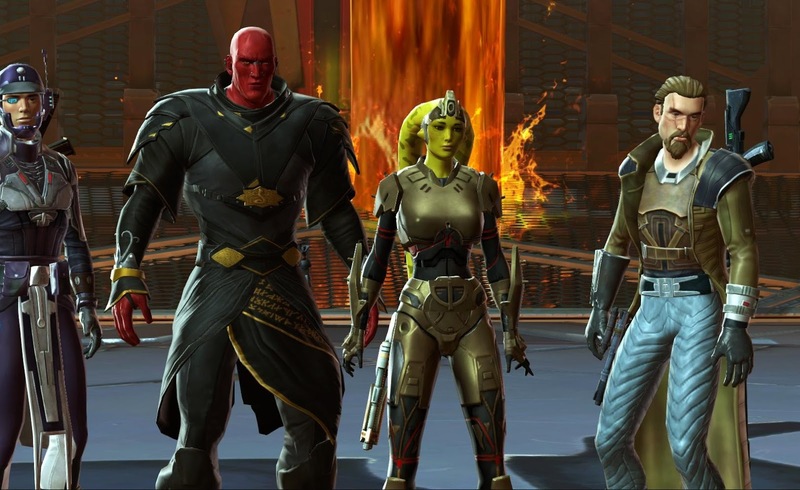 I've also always loved the little group cut scenes and how cool they make even a bunch of randoms look, which is why I do miss them in the newer content - though I don't miss people going "spacebar plx". Never thought I'd hear Shintar use the word "chilling". Just doesn't fit your vocabulary style. I'd LOVE to hear you use it in a sentence next stream. Oh, I think you'd be surprised by the weird mish-mash of words that are part of my vocabulary. :P Comes with getting a lot of my English from the internet. The random Yiddish tends to surprise people the most. Do you also pour a forty on the curb after a raid wipe? Gotta keep it REAL!! !